No time for fooling around. It’s a Monday and that means Gems then Salsa. It was a dull day and when Gems arrived around midday I chose to do some painting rather than go out walking in the rain. I’d been wanting to copy a painting I saw at Eilean Donan castle last month. It turned out ok, although Scamp turned her nose up at it. I did manage to get a few photos in the afternoon after the singers had left. Just some flower shots in the garden and some raindrops on leaves. 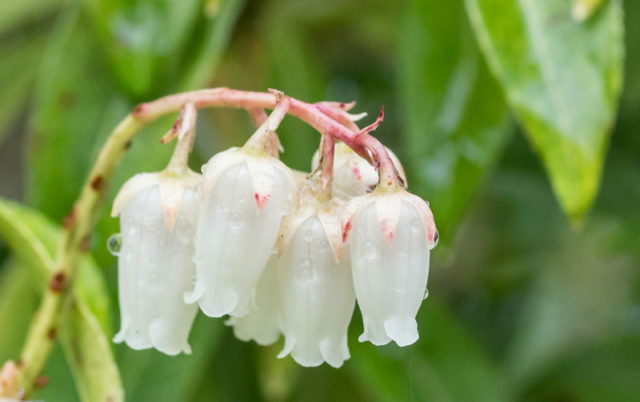 The PoD turned out to be the little white bell shaped flowers from the Piers. Salsa tonight was the first night of the Rueda Club which is the Advanced class under a new name. Some returning advanced salseros, but nothing like the numbers we need to keep the class going. Two new totally forgettable moves whose names evade me at present. I don’t know how long it will continue in its present state. Managed to survive two hours of dancing without too many aches and pains. Tomorrow a trip in to Glasgow to JL to see if I can claim a replacement Fit Bit under guarantee. Just within the two year guarantee which runs out in two weeks!